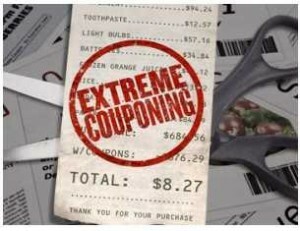 TLC is starting their new 12 episode series of Extreme Couponing this Wednesday night! I know there are a lot of mixed reviews on the show due to the unrealistic nature of the series, but I also know that I have a lot of new readers who are just starting to coupon, so I am going to share more about how to get started. Once you understand the basics of how to use coupons, the rest is just practicing. Couponing can be vert addictive, and it’s easy to take home things you won’t use or things that you don’t need. Also, every store has different limits and rules in place, so I suggest that you read over the store’s coupon policy first. Looking for a specific coupon? Be sure to check my database before you shop! I really hope you’ll take the time to check out these posts above. You will find some great information that will hopefully help explain how to coupon and how to pay less at the stores. Couponing is a process. You’re not going to start out walking out of a store with $2,000 worth of stuff the next day. To keep up on all the great deals, you can subscribe to my FREE daily email updates. An email with all the latest deals and freebies will be sent out every day around 5pm CT.